Our first Life Member. Having started his baseball career with the Canberra Club All Stars then moving into ACT Baseball Association administration originally as Publicity Officer and later as President of the new summer juniors. David became the face of baseball on Radio 2CA and even for a short time on CTC TV! 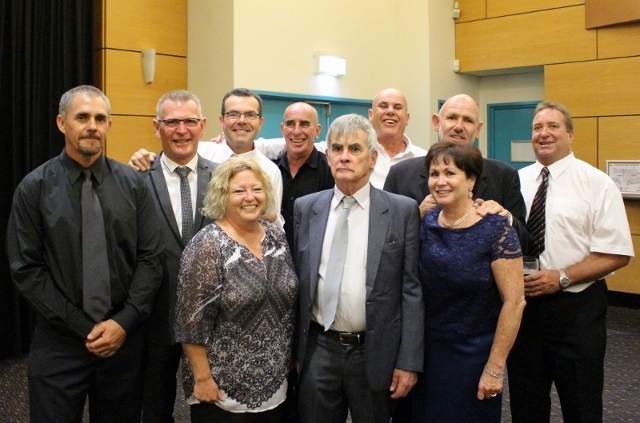 He coached many junior teams and was a fixture in coaching Senior B & C Grade for many years. Dave is still active around the club and continues to offer advice to all. Ray moved from Sydney to Canberra and played with Vultures. Ray became a real cornerstone of his new Ainslie Club, living in Lyneham. Uncle Ray (and Aunty June) were friends and mentors to all in those revolutionary years of transition from winter to summer baseball. At different times Ray was President, coach, administrator and always an all round good guy. The Marlin family presence really put some concrete into our foundations. We all wore uniforms created or adjusted by June at some time There were many Ainslie family BBQs at Wattle St. Ray was also recognised as an ACTBA Life Member for his same approach and contribution to the sport in Canberra. The real man of many hats. John Ferrier was a tireless terrier and long time steerer of the club. Whether on the bridge or in the boiler room, John was an enormous "non playing" assistance to the proper conduct of the club and Association. Another huge family involvement in our club. In 1997 Peter Amos was recognised for his contributions. Blue and Rose dived head first into our club when they brought the young Amos family to Canberra. Not one to start in the baby pool Blue dived in the deep end and what a good swimmer he was. Team Manager, President, Treasurer, Equipment Person, Bus driver, stirrer and passionate supporter and inspiration. The Blue laugh and given with the honest perspective were a gift to all in our club. Not only a legendary player for as long as I can remember but coach, President, Umpire etc. etc. You name it and Pop has done it with style - never a gripe. Greg has also been recognised with ACTBA Life Member for taking his gifts to the wider game in the ACT. Currently an ACTBA Director and umpire, still playing. Another full family involvement beginning with Greg, Graham and David, Mum Muriel being an early scorer and even encompassing the Hoorweg cousins. There has always been Anne. One of the self-styled "Bearettes" - the wild girls of the Ainslie Baseball. This of course led to Hayley and Steve our highest profile player now with the Atlanta Braves. Never played a game but has helped 1000's of others over more than 30 years. Scorer, Secretary, Canteen person, assistant at all functions and various committees-including tonight's event. Yet another generational member with her own family of 3 boys playing, along with boy no 4 in Luke. Another baseball marriage and a real Ainslie and baseball family. Yet another of those who have done it all-mostly behind the scenes. Long time player but also coach and tireless worker at anything ever required. Has recently semi retired from playing and given his hose to Kenty but has become a club sponsor with the Narooma Ice Creamery and Crutchfield family continuing to help from a distance. Parents Dan and Hazel both early stalwarts. Wife Jodie rounded out the picture with her years of scoring and subsequently involved her sisters and families, more recently the Forders. A long time player at every level in the club. Coach and helping hand over many years. Always there for the Bears. Another of those marriages with a strong cross to the Marlin family - cousin Tracy. Three boys also add to the playing list and Sharne now picking up the score book. Colourful Club character! Has been to the dark side-with a short stint at Eagles but survived with some scarring. Player, Coach, long time and several time Treasurer, Uniform man - can be a little volatile at times - always entertaining! Yet another family of Bears with Lou scoring, Will playing and now Eliza and Katie playing ladies. After a conversion from cricket Stuart became a fixture at the Bears and rapidly became a first grade player. He has been involved in many Club activities or projects including the construction of the batting cage. Has been a committee member over a period of many years.